And next on the list for trying out with a newborn… the lillebaby COMPLETE! Since having little Miss S., I’ve been primarily ring slinging or wrapping her. 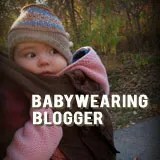 My other go-to carrier (and my hubby’s fav!) has been our Catbird Baby Pikkolo (see previous blog for more about the Pikkolo with a newborn). Now that she’s a bit bigger and has some head/trunk control, I’ve been trying out some other buckle carriers with the little lady. We really enjoyed the lillebaby COMPLETE Airflow one hot afternoon. Click the picture below for all of the reasons why!